The return of Triumph’s most famous name was the one everyone was waiting for from the revived Hinckley marque. And when the all-new ‘Bonnie’ was unveiled at the 2000 Cologne Show, it certainly didn’t disappoint. This time round, however, the twin was designed as a gentle, charismatic, pleasing ‘retro roadster’ rather than being the performance bike the original had been. As such, its goals were modest: novice-friendly manageability, mass-market affordability and authentic retro style. It hit the mark on all counts. It was good looking thanks to its all-new, but retro-styled air-cooled parallel twin, traditional but updated twin shocks, cradle frame and host of olde world design touches. It was easy to manage and ride thanks to its deliberately ‘cute’ proportions, relatively light weight and soft drive and manners. And, best of all, surprisingly affordable. One of the Triumph’s targets was Harley’s popular 883 Sportster and the Bonnie ran rings around the American. But, successful though the new Bonneville was, some riders were slightly underwhelmed. To some, its easy-going performance was more flaccid than fervent; to others, being built down to a price meant the base model was pretty, well, basic. And this is probably where Triumph has proved most successful of all with its revived twin. Very quickly a range of variants to suit all tastes emerged. The posher, more retro T100, with chromed cases, twin dials and more; the rugged Scrambler and sportier Thruxton. 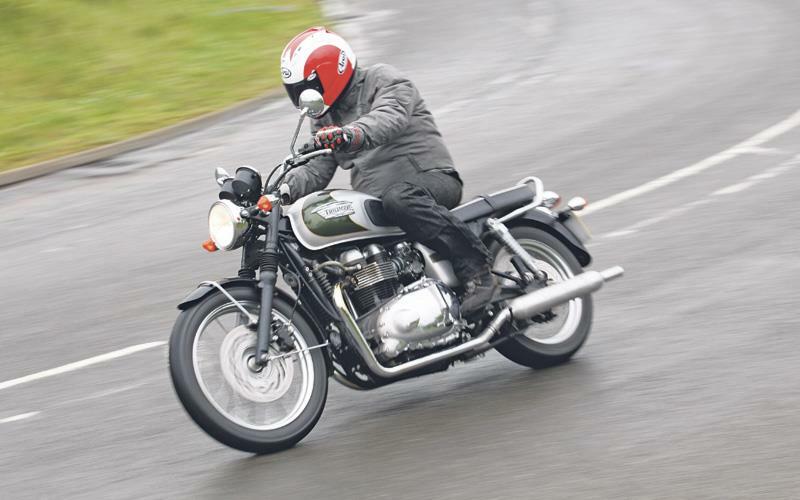 The best measure of the Bonneville’s success is that the latest versions, the fuel-injected T100 and SE (as well as the Thruxton, Scrambler, Speedmaster and America spin-offs) remain as cornerstones to Triumph’s range 13 years on. They have barely changed and are among the marque’s best sellers. Controversially, production moved in 2004 to Triumph’s Thailand production facility to keep costs down, a move which necessitated the loss of ‘Made in Britain’ badges from its engine cases. In addition, the T100 went up to 865cc in 2005, the standard Bonnie following in 2007, while all switched to cleverly-disguised fuel injection in 2008. Two Bonnies remain – the T100 with ’60s styling, lower seat, 19in wire wheels, peashooter pipes, a slightly higher spec (and price) reflected by twin dials, two-tone paint, extra chrome and polished engine cases; and the ’70s style SE with 17in alloy wheels, thicker seat and more basic spec. Both have their strengths and followers, the T100 for style and spec, the SE for better handling, versatility and manageability (especially for shorter riders). Both, too, are proven, refined, reliable, get a gentle, cosseted life from owners and are ripe for personalising. Triumph is one of the best-known motorcycle manufacturers in history. Examine every significant bike that has contributed to the Triumph story by watching ‘Best of British Triumph’ over at MCN-TV.com. Enter the code TVTRIAL for 14-days of free access to over 100 motorbike films, TV programmes and documentaries.